Create this simple wreath from some papers. Just cut green paper into leaves and flowers shape. Then, write down anything, here the creator write name. Put this wreath into a frame and hang on the wall. Everyone can make it easily. Super creative! Rather than throwing away chocolate candy wraps, it will be better to change them as something useful. Attach them to the wall with glue to fill the space of your wall. Oh, you may cut them firstly into any shapes. This is awesome. With paper rosettes, you can create colorful wall art that will improve your room decoration. Play with various colors will make the wall more attractive. Even, you may do this project with your children. What a lovely lighting design! This glowing hearts will shine at night after you switch on the lamp. The material can be anything but better to use board or hard paper. You may also try to paint with other colors for more eye-catching look. Graphic art is always cool. Here, the owner of this house applies graphic wall art to fill the space. Using white board and black paint, the graphic art seems as the focal interest of this room. This simple project can be done in minutes. Spell out the word that will boost your mood, trigger your spirit, or make you feel calm with wire. 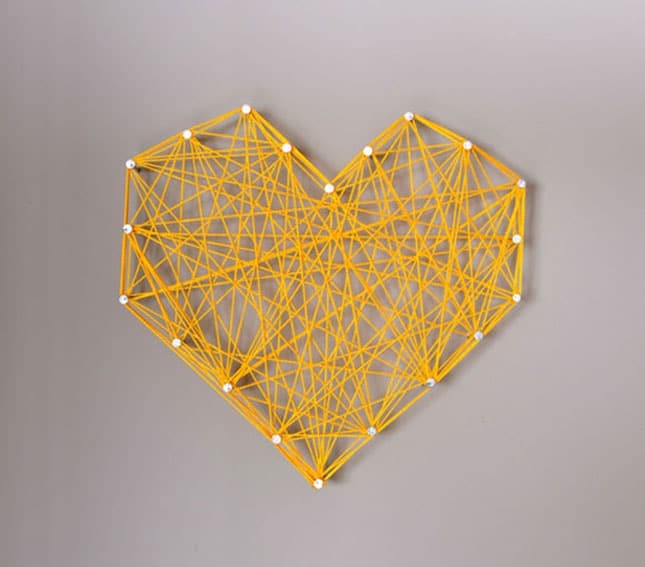 Wire wall art looked as simple idea but give much effect towards wall decoration. It can easily combined with other accents as well. Fill the space with colors to improve wall design. Here, Popsicle sticks work best for this wall. First of all, you need to collect Popsicle sticks as many as you can. Then, paint them with different colors and attach them on the wall . This is sweet and artistic for your wall decor. The color can be anything as you like. You may add a frame to make it more interesting. However, let it like the picture already looked interesting.